Few days back we reviewed an unofficial Facebook application for Windows mobile and Symbian mobile phones Now Windows mobile team came up with an official Facebook application for all Windows mobile OS falling under version 6. The new application has some extra features like video -photo upload , file sharing and many more . Download Facebook for Windows mobile . Upload videos directly from internet enabled Windows mobile. Share and tag photos . All other normal Facebook operations like status updates , wall posts etc. are also available . 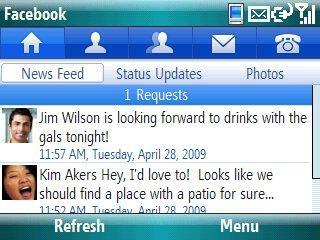 Download Official Facebook application for Windows mobile .